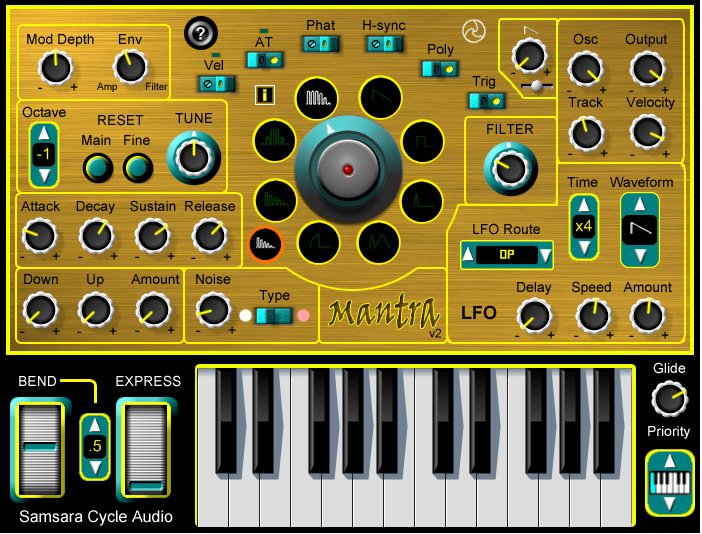 Mantra is a 2 oscillators analog synth. As the name suggests, mantra is a very versatile free VST plugin in which you can use it for analog editing. List free VST plugin comes with so many settings with no tops and equalizer. The interface of Mantra free VST plugin it’s very simple but it looks hilarious and lux. In the left bottom corner there are two adjustment from samsara cycle audio in which you can set and adjust the bending and then the expression there is a number representing one to 10 so that you can adjust the volume. This free VST plugin also contains and provide you with keyboard interface so that you can visualize whatever it is connected to your media keyboard. You can also set the Glide and priority. This functionality expands the use of keyboard. This oscillators analog synth enables LFO setting in which you can play around with delay speed and amount. If you have idea to have a better or further adjustment you can go with LFO route. The waveform is also adjustable based on time. You have also privilege to adjust the attack, coma system, and release. This free VST plugin for analog synthesizer works well for your music project. You can use this free VST plugin with major daw digital audio workstation like FL Studio and then cubase pro Tools and so forth. You can download free VST plugin from freeVST.org. Enjoy making and developing musical Fusion and good luck hopefully you can find what you are looking for. Please Subscribe and share this free VST plugin. If you have any requests don’t hesitate to contact us via the contact form. Thank you very much.